'Economic stability in Gaza brings quiet,' says Liberman, adding that return of prisoners is a necessary condition for agreement with Hamas. 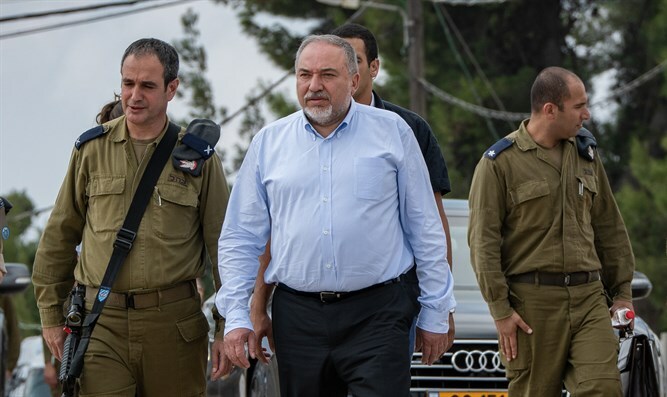 Defense Minister Avigdor Liberman, who watched a military exercise in the north Tuesday morning, referred to the mass funeral of the terrorist held in Umm al-Fahm last night. "It is very unfortunate to see citizens of Israel who enjoy freedom, prosperity and economic growth, more than a thousand people, accompany a terrorist with Palestinian flags and with cries of 'with blood and fire we will redeem the martyr.' This indicates that these people do not belong to Israeli society, and their Israeli citizenship is completely erroneous," Liberman said. The defense minister reiterated his position that Umm al-Fahm should be handed over to the PA as part of a land swap deal. "At least I never hid my view of the final status agreement with the Palestinians, if it ever will be, there is no reason why Umm al-Fahm should continue to be part of the State of Israel but [rather should be] part of Palestine, and I am sure that under Abbas they will have the same freedom of expression and the same economic advantages, and of course will enjoy Palestinian democracy at its best." Liberman was asked why the Kerem Shalom crossing is open for the passage of goods despite the terrorist attacks that have taken place in recent days alongside the continued launching of balloons from Gaza. "When we talk about the facts on the ground there is undoubtedly a dramatic drop," the minister replied. "The shooting incident yesterday, too, is apparently a single person who is not affiliated with anyone and it is impossible to completely prevent every terrorist incident. Also regarding balloons, when I see in the media that there are balloons in the south and call the IDF, the Southern Command, they tell me that it is true that there were balloons, but these were balloons only and not incendiary balloons. There is no doubt that there is a drop, but that is not enough, so everything we do and what is really important is to create an absolute connection between the security calm and economic benefits. “In the end, we have to understand that looking at another 12 years, what we want to see in the end, what we are talking about is security quiet, so we must also understand that the function of the economic situation, economic stability, also ensures security calm. I hear countless stories about the arrangement of the State of Israel with Hamas and I repeat, we are indeed talking to the Egyptians, the UN and the international community. " He emphasized, "As far as I am concerned, there is only one arrangement and this is the reality on the ground, and if we want to reach some kind of general arrangement, then a specific condition is an arrangement on the issue of the prisoners and MIAs. We are operating unilaterally in accordance with the reality on the ground, and apparently this will continue. "